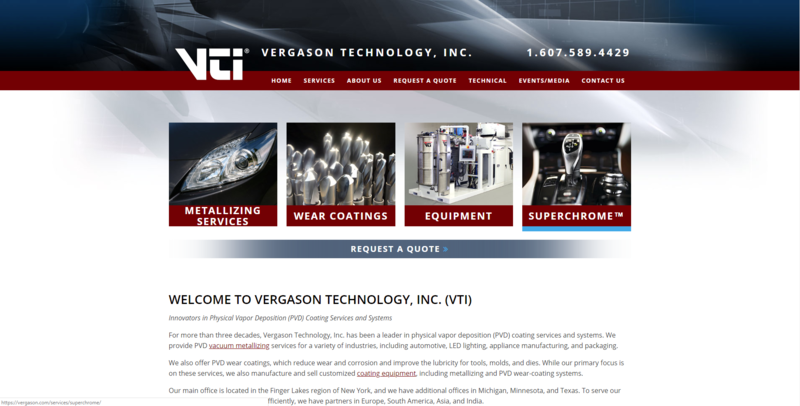 If you’re in need of flawless vacuum metalizing services, then you need Vergason Technology, Inc. At Vergason, our experts have years of experience in the field of physical vapor deposition (PVD), and our state-of-the-art facility holds all the latest technology to get the job done perfectly. Though the use of vacuum sealed chambers and low heat, we are able to evaporate a variety of metals and deposit them in a thin, uniform coat on any number of substrates. Conductivity isn’t an issue with our PVD techniques; in fact, we can cover materials ranging from metal and plastic to even glass. As a bonus, we also offer a variety of metallic colors to fit your project needs. However, at Vergason, we’re not just content with being a good vacuum metalizing company; we actively strive to be the best. We offer EMI/RFI/ESD shielding services to cut down on electromagnetic interference impacts, as well as NexSteel™ decorative coatings that mimic the look and feel of stainless steel at a lower cost. As always, with any of our vacuum metalizing services, you can expect increased durability, beauty, and longevity in your end product. In addition to our basic vacuum metalizing services, we offer environmentally friendly Superchrome PVD coating that requires no top coat, PVD wear coatings that improve tool life and reduce friction, and metalizing and PVD coating equipment. No matter the service you select at Vergason, you can relax knowing that you’ve chosen a vacuum metalizing company that has set the industry standard for over thirty years. Contact Vergason today for a free quote, and learn how vacuum metalizing can improve the appearance and performance of your products and devices.